Do Missing Teeth Really Matter And How Can I Replace Them? No one wants to be seen with spaces in their s mile, but missing teeth are far more than just unsightly. When a permanent tooth is lost and not replaced, there are numerous problems that can result. First, the remaining teeth often do not stay in the same place. They frequently shift causing issues with crowding or spacing of the remaining teeth. This awkward new arrangement can make cleaning the teeth more difficult and increase the possibility of developing cavities and gum disease. Further, the improper bite that can result from tooth loss makes speaking and eating challenging and may also lead to headaches and TMJ pain. Finally, for those of us who just love to look youthful, loss of teeth can cause your cheeks to sink in, making you look old before your time. Losing your adult teeth is all around a really bad deal. But, if you have already lost teeth, there are many ways to address this problem. You don’t have to hide your smile or be embarrassed to be seen in public. Those dark areas caused by missing teeth that show when we speak or smile can be easily eliminated. Today there are numerous excellent solutions for the problem of missing, unattractive, or misaligned teeth. Dr. DeLoache and her staff offer a full range of prosthetic services: crowns, bridges, veneers, whitening, implant restoration, and removable full and partial dentures. But the extra good news is, while planning for these more in-depth and permanent services, there are some solutions to relieve the immediate problem of unattractive and missing teeth quickly and affordably. These problems can be addressed with the simple dental prosthetics, Valplast Partials and Snap-On Smiles. The gaps left by missing teeth can be immediately filled by these discrete appliances. 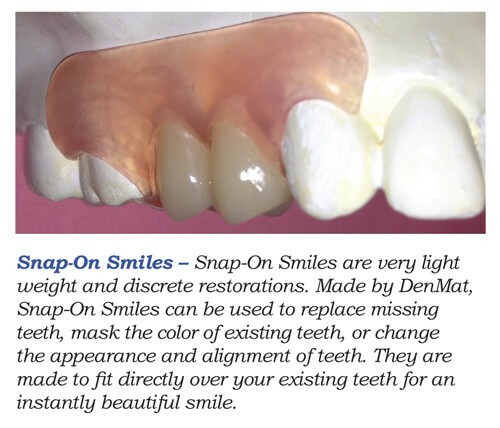 Valplast Partials and Snap-On Smiles can produce a more youthful and vibrant appearance, addressing not only lost teeth, but color and alignment. Nothing is more attractive and a greater confidence builder than a beautiful white smile. Fortunately, with dental treatments that are available today, offering excellent esthetics at accessible price points, there is a beautiful smile for everyone. Valpast Partial – This a light weight, flexible partial that is almost invisible in the mouth. It can be very small, replacing one to two teeth or several teeth in either the upper or lower jaw. Valplast Partial for teeth missing on one side only, teeth and gum shade are matched to the patient. Call our office at (610) 696-9135 and ask to schedule a Complimentary Smile Evaluation.